Sir James’s views against centralised power led him to fight against the vision of integrated Europe as laid out in the Maastricht treaty. He was in favour of a strong association between European countries, but not if that meant a single strong central government. Loss of national sovereignty would inevitably follow, making Europe into the political equivalent of a conglomerate, and the social consequences of societies being forced together in that way would, he believed, be catastrophic. The Treaty was the blueprint for what was to be Europe’s biggest project for the next decade, economic and monetary union; paving the way for the Euro that Sir James believed would inevitably lead to massive economic problems due to centrally-determined economic strategies. 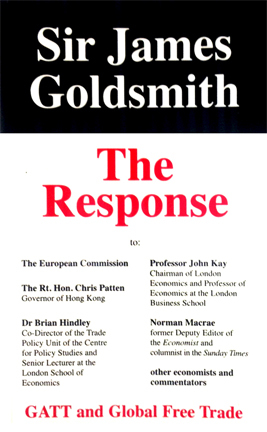 When France called a referendum to ratify the treaty in 1992, Sir James decided to do something. He began by donating 500,000 pounds to help former editor of the Times Lord Rees-Mogg challenge the validity of the Treaty in the English courts. He then appeared on Channel Four Television’s show Opinion in 1992, speaking on how the world’s reckless pursuit of economic growth was doing more damage to society, the environment and mankind than anything else. Policies designed to create one big healthy Europe were making individual societies poorer and unstable, and Maastricht would accelerate the process, he said. He urged people to call for a referendum and vote against Maastricht – and then campaign for a strong Europe based on its constituent nations. This drew a positive response and Sir James’s campaign helped bring down the polls from 75 per cent in favour to only 51 per cent on voting day. Perhaps his most prescient forecast was that the smaller, less disciplined nations – such as Greece and Spain – could not survive within the straitjacket of a single currency. Draconian economic measures, imposed on an already weak state, would lead to social breakdown and violence that could pull Europe apart, he said. 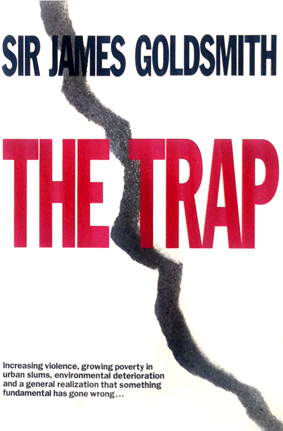 The financial crisis in Greece, where the threat of bankruptcy erupted in riots in 2010, and the threat of this crisis spreading to Portugal, Spain and even Italy, along with current youth unemployment rates in these countries, shows how insightful Sir James’s ideas in 1993, before the Euro even came into existence, were. Long before it was fashionable to do so, Sir James argued monetary union could not work without political union, but that would mean a transfer of sovereignty to Brussels, which no one in Europe had voted for. Sir James never lived to see the Eurozone crisis he had predicted, nor the longest recession in the history of the industrialised world which was undoubtedly caused by all the factors he identified in The Trap: huge budget deficits, massive imbalances of trade, over-extended financial institutions and the biggest banking crisis for seventy years.